There are a few statistics that a Forrester report entitled Directors’ Digital Divide: Boardroom Practices Aren’t Keeping Pace With Technology has thrown up that make sober reading for any governance or security officer (as perhaps the title of the piece might suggest). The first shock is to learn that at boardroom level, 56 percent of members use a personal email address to exchange information with one another. In practice, that usually means that directors are copying and pasting potentially sensitive text and data, and sending or storing it insecurely. Additionally, only 42 percent of board members use any form of board management software that has a secure chat function. And while it’s to be expected that much communication between professionals at this level takes place face-to-face, the distributed nature of today’s boards – with members spread around the globe – means there’s significant unencrypted and unguarded messaging taking place. Those figures above are particularly worrying both from governance and risk management points of view. Clearly, the nature of the information passed at this, the highest level in any enterprise, can be highly sensitive. Data could contain insights that would be, at best, a PR nightmare if they were to fall into the wrong hands and, at worst, falling into the laps of competitors. Despite being perhaps the most critical area of interchange in any business, boards of directors and their officers are using ad hoc, insecure and uncontrolled methods to get their jobs done. Regarding risk analysis alone, this is off the scale. It’s this type of statistical analysis that drives on the GRC technology professionals at Diligent (GRC is governance, risk, and compliance). In fact the company’s commitment to the ‘G’ in GRC is echoed in its platform’s name: Governance Cloud. The Diligent solution is one that can change the way board members and company officers operate, making their use of time more efficient, more secure, and more productive. For company secretaries too, the pulling together of reports, questionnaires, annual reviews and the host of other documentation (some of which are a legal requirement) is transformed. It is, in the vernacular, a no-brainer. Diligent’s Governance Cloud offering is an environment in which board members and secretaries are happy to work, and if any user comes across any aspect of the solution they’re not sure about, there’s 24/7, friendly (award-winningly friendly) support on tap. It may seem incongruous to highlight this particular aspect of Diligence’s offering, but it’s a well-known truth in IT circles that the most decisive factor in the successful uptake of any software solution is its usability. The IT function in any organization can provide a platform, but ensuring board members use it represents a challenge. In many instances, companies simply repurpose some other platform for use at this critical level, and often the unsuitability of the solution results in low take-up and a return to insecure messaging and personal email communications. Diligent’s power, ease of use and specificity for board-level use has led to over half of Fortune 1,000 companies using the solution for their board activities. – A secure, simple to use messaging platform that obviates the need for (usually insecure) email traffic carrying sensitive information. – A mechanism for gathering votes, opinions and safely having internal discussions. – A place to take evaluations of board activity, complete questionnaires, undertake assessments, and pull together information, glossaries of terms and reference materials. – A way to speedily and efficiently resolve conflicts, and conflicts of interest. – A method of managing all entities. 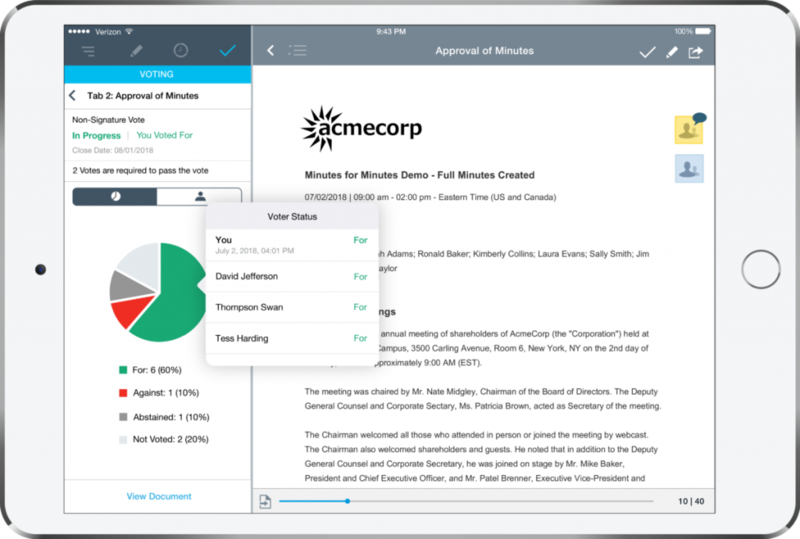 – A platform on which to take and distribute board meeting minutes. Among Diligent’s 145,000-plus users right across the world, the directors, officers, and secretaries are working with increased efficiency, lowering costs of essential activities significantly, ensuring compliance, and promoting good governance and practice. Additionally – especially key in this digital age – users can do it all securely, on-platform, and internally (the need for external suppliers and/or help is removed). By providing the functions explicitly needed at board level, the Diligence platform is the way that companies of any size can work together more cohesively. With a proven track record of serving corporate, financial, government, education, healthcare, and non-profits across the world, it may be time to join them. Get in touch with a representative today to talk you through the possibilities, or sign up for a short demonstration of the Governance Cloud platform’s capabilities.